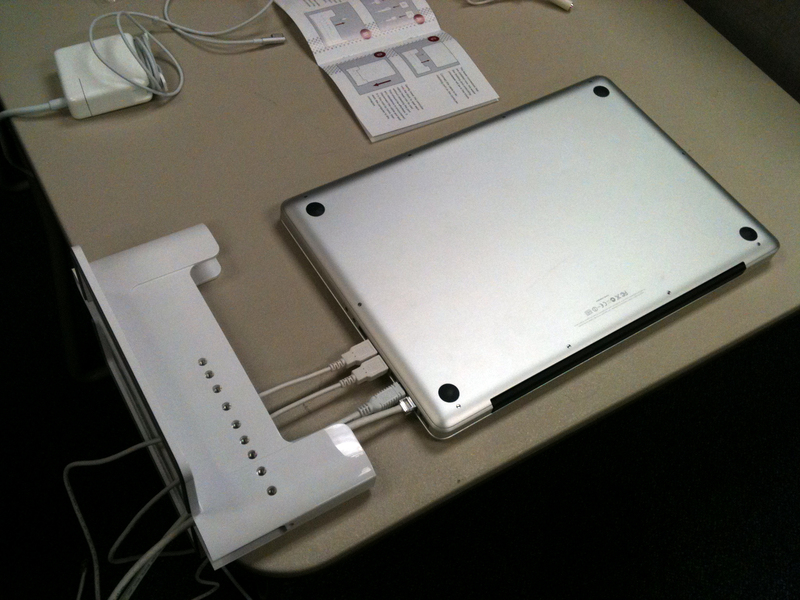 With MacBooks (s aapl) getting closer and closer to desktop performance, some may find themselves in need of a docking station. PC docks about, but there are few Mac options. One of those options is the Henge Dock. These docking stations are designed for MacBooks and MacBook Pros. The model I got my hands on is for the 17-in MacBook Pro. Inside the box, you will find the plastic base along with the following cables: Ethernet, FireWire 800, USB Extenders (3) and audio (2). 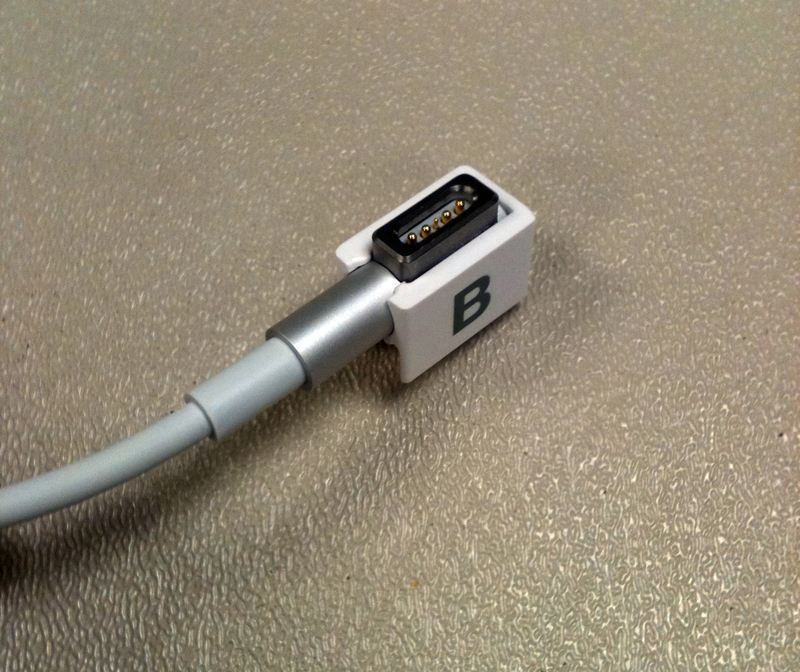 Not included are a MagSafe power adapter or a DisplayPort cable. You can order DisplayPort extenders and adapters from the Henge Docks site that are guaranteed to have enough slack for the dock. I would recommend buying another power adapter since removing the one used in the dock becomes rather tedious if you do it frequently. 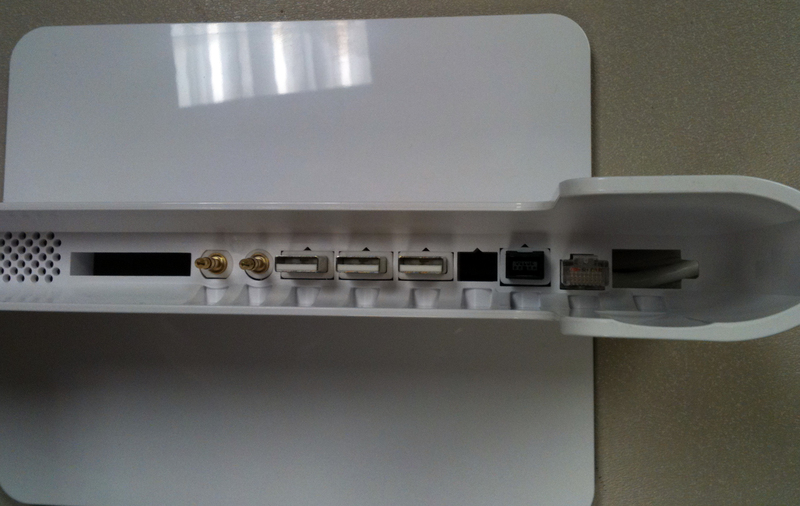 Assembly is a little tricky, but the ability to choose which ports you want to extend is worth it. It took about a half hour to assemble everything and the end result seems pretty secure. I started by feeding the wires through with the dock laying on its side. After about half the connectors were hooked up, I flipped everything up to its normal position and hooked up the remaining connectors. One thing that was confusing is why the audio connectors are shaped to fit into a particular slot on the dock but the other end of the cables aren’t marked as to which is headphone or line-in. Just remember which you feed through which hole. The hardest part was getting the DisplayPort to VGA adapter to fit. I would recommend purchasing one of the official Henge Docks adapters or at least their DisplayPort extender, it will save you some trouble. When it’s all put together, it works rather well. 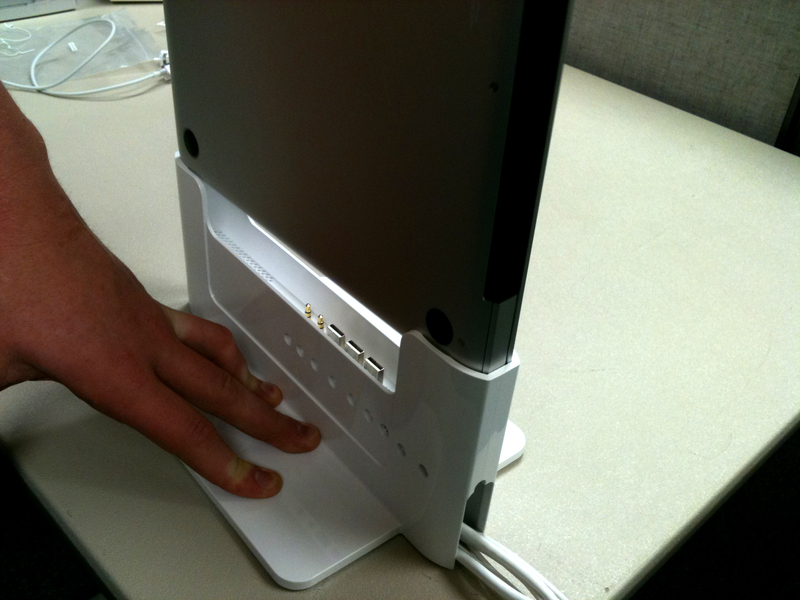 The manual states that you should never rock or carry the dock around with a MacBook docked. You’ll notice right away that it can be top-heavy, so place it on secure surface that doesn’t wobble to avoid accidents. 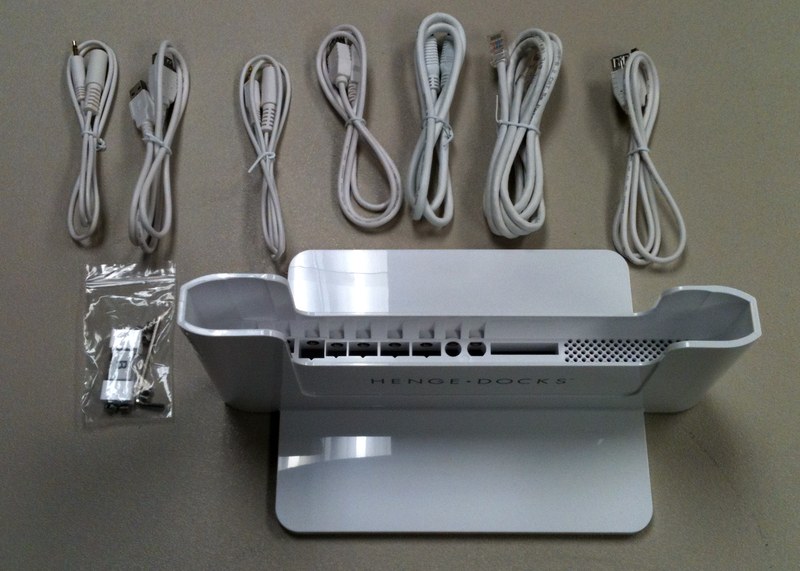 The only real drawbacks to the Henge Docks system are that you can’t access the power button or the FaceTime camera. If you accidentally shutdown the MacBook, you’ll have to un-dock the computer to open it up and power it back on. Since running the MacBook in clamshell mode is the whole point of a dock, you’ll have to get yourself an external USB webcam if you want to be able to do video chat. With limited options for docking stations, the Henge Dock does everything it claims to. If you want to pretty up your desk, and you frequently switch between desktop and portable configurations with your MacBook, the Henge Dock is an idea companion that will save you many unpleasant plugging and unplugging rituals. I’ve never understood the need to add more hardware to your already cluttered desktop. Does a dock really reduce desktop clutter? And why would you want to close your laptop? Don’t you want the benefit of two screens instead of one? Chriet, from my perspective there are two advantages. The first is convenience, just being able to drop it in the dock or pull it out rather than plugging in 8 cables (power, headphone, 3 usb, firewire, display, microphone) and then unplugging 8 cables…minor but still more convenient. The bigger factor is getting the MBP vertical and off in a corner away from my work space rather than a horizontal footprint right in front of me. I have all the screen real estate I need with my Cinema Display, the premium is on space for things like speakers, mixer/amp, iPad dock, iPhone dock, etc. in the work space right around the monitor. The point of a dock is to be able to easily connect to all of your desktop peripherals, not to run in “clamshell mode”. You could do the latter even without a dock. The inability to use the built-in display is also a potential downside to this style of dock for some users. I currently use my MBP on my desk the vast majority of the time and having the built-in display available as a secondary screen is surprisingly handy. Of course, I do have to plug in something like 6 cables which is a lot less convenient (and a lot uglier) than a dock, so I’d be interested in a dock that let me plug-in/unplug easily (and hopefully contain some of the clutter) while still letting me use the built-in screen. This story contains a MAJOR inaccuracy. In point of fact Henge does NOT currently offer a mini display port extension cable, only adaptors from mdp to other formats. So, if one wants to use the Dock with a Cinema Display (surely not an unusual set up) then the dock MUST be placed close enough to the Cinema Display for the integrated cable to reach the dock. I have found this out the hard way, having owned a dock since January and still unable to use as the spot I would like to place it is not within a foot of my Cinema Display. I have investigate several 3rd party extensions, but none match the size specs of Apple cables, and tolerances on the Henge dock are so tight that anything even slightly larger will not fit the cutout. Henge has been saying for 3 months they are having extensions fabricated, but do NOT offer them yet. 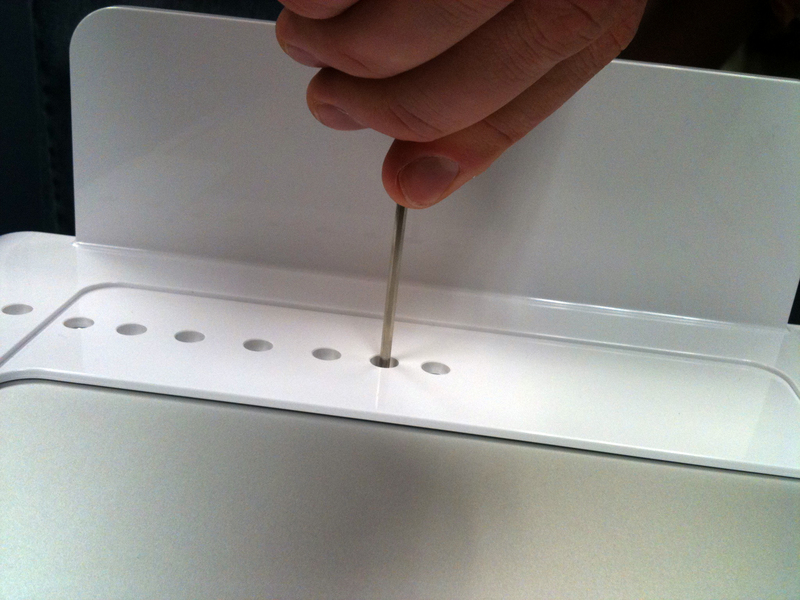 So if you are planning to pair a MacBook Pro with a Cinema Display, buyer beware! You must, at this point, place the dock within reach of that CD cable…so basically right next to it! That’s nice. We aren’t talking about PC’s. I’ve had my Henge Dock for a few months and it’s awesome. My only compliant is that they put the screws on the same side as the Apple logo. In my case I’ve got a nice Ironman Sticker on the lid and I’ve got to look at the screws if I want to show it off on the desk.